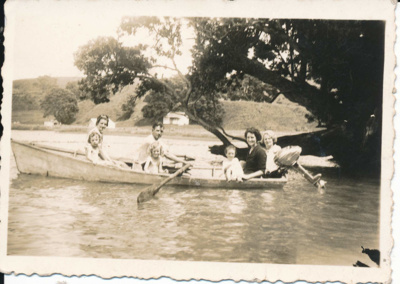 Jaques family in boat in front of Mangawhai camp ground 1938. Back L-R: Meryl Dibble, Ken Oldfield, Mrs Kenly, Marie Jaques. Front L-R: Sadie Yorth, Marilyn Oldfield, unknown.